Every Farmville fashionista mourned the loss of the Dressing Room; it was the premiere distributor of clothing with labels that you would be proud to flaunt in our humble college town. (It was even mentioned in a featured article in Glamour about little black dresses.) So what’s a well-dressed girl to do? We have some pretty creative and economical ideas that don’t involve lassoing your girlfriends and hitting the open trail. -Buy in Belk. Get it? It’s the only department store this side of the Appomattox. They’re well-stocked with an array of interesting pieces, especially flattering tops and mountains of boots. Their collection of accessories polishes the bejeweled gamut of different tastes, from pearl necklaces to python rings. We manage to find a great deal every time we go there – they often have sales up to 80 % off apparel, Pfaltzgraff, and toaster-ovens. Jenni recently scored two scarves for $5 each, both marked down from $40. You may have to search around for pieces that suit your style, because their stock mostly caters to working, professional women and their trend-tastic daughters. That’s not a bad thing at all, it just makes you work harder to avoid those jelly-filled ballet flats. -Cato is located to the left of Wal-Mart off Main Street. Despite its moderately large size, you may not have noticed it thanks to the giant Wal-Mart. Cato specializes in clothing for the working woman, but mixed into their pantsuits and pencil skirts are some spicy items. Leather jackets, bright heels, and bras that look like they were meant for the Victoria’s Secret runway? Yes please! When these bras are ten dollars a pop, it’s completely justifiable to buy five of them in one visit. To us, anyway. -Guinea Creek Crafts: don’t know where it is? That’s why we're here. It’s on Main Street across from Charley’s, one salon down from Penelope’s. Among beautiful woodwork and baskets, they have candles, holiday décor, and our favorite, earrings. Their earrings are all different, interesting, and a dollar fifty each. At a price like that, you can buy a pair for everyone who loyally follows your Twitter feed as a thank-you gift. For those of you who can have candles, this is the perfect resource, and if you like to decorate for Halloween, be sure to pick up a ghostly gourd or just browse the Halloween/Christmas room. -Goodwill hunting: you have to search to find buried treasure. It’s located in the shopping center with Buffalo Wild Wings and Rite Aid. Among all the ridiculous 80’s windbreakers there are some real gems. Sometimes a little bit of quirkiness from Goodwill is the perfect thing to pull a boring outfit out of dullsville. 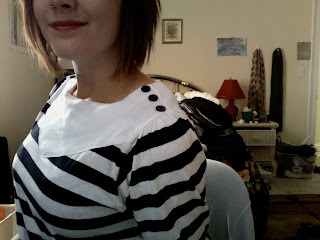 For example, Amy recently found a nautical striped blouse complete with shoulder buttons for about three bucks. Jenni found a bright striped blouse with a ruffle, which she dubbed "Circus-chic". On our last journey, we also found books, belts, and got mugs for free with our purchases. For those of you that haven’t had three to four years of exploring Farmville, we hope this is a helpful guide for your adventures in style.